The VS Battles Wiki presently consists of 19,418 pages, most of them listing the statistics of characters across different fictional franchises. However, there is a tremendous amount of work involved in maintaining the accuracy of statistics and upholding a high quality for the profiles. In order to ensure that all edits made are of high quality, there are certain rules to abide by when editing. These rules must be followed in addition to the site rules. Please utilize proper grammar, spelling and sentence structures. Kindly utilize source mode editing. Doing so simplifies editing for other editors significantly, and prevent severe distortion of page structure. You can change this to your default editing mode in the preferences settings. Feel free to overview this image to observe a basic example regarding how to properly write profile pages in this editing mode. Do not use iOS 8 while editing pages in this wiki, as it causes a glitch that automatically removes all categories within the pages that you edit. Please update to a newer version of the operating system before starting to edit. When images of what a character looks like are available, preferably upload them here, and insert them at the top of the related profile page. You can automatically insert much of the structure listed in the Standard Format for Character Profiles into a new profile page if you click the "Create a new article" button, and then select "Standard layout". Only create profiles for characters that you are very familiar with and know much about. Remember to present evidence or logical arguments regarding why they should be rated as they are. It is encouraged to make blog or sandbox drafts of profiles before actually publishing them. You can access your sandbox by following this link. This way you can clean up and perfect the profiles before their publication. Don't sacrifice any details for the reading convenience. Try to get the information across in the most efficient manner. If you don't manage to come up with a short explanation, then stick to a longer one. When making sweeping or significant changes to an established and/or popular character or verse, please create a content revision thread first, so that it may be evaluated by the staff and the community at large to ensure that it falls within our guidelines. Inserting unmotivated ratings into profiles on the basis of personal bias will likely result in a block. If you notice another user inserting blatantly false ratings, please inform the administrators about the incident, via the rule-violation report thread linked to in the front page, and about the member responsible for the aforementioned incorrect edits. When you are revising character statistics, please remember to provide links to the related concluded content revision threads in the edit summary boxes. It greatly helps to avoid misunderstandings when the staff are patrolling edits, as they might mistake the changes for vandalism otherwise. Please do not add "via power-scaling" as a justification for a character's abilities, without indicating who the character is being scaled to and said character's feats. Doing otherwise makes the reasoning meaningless and complicates profiles. Prior to adding external calculation links (likely to justify character statistics), preferably simultaneously back-up the URL link into the Wayback Machine Internet archive. By doing so, if the original post is lost, there will still exist an accessible copy, which can be used to update the link accordingly. If you encounter a dead calculation link, you may find a backup in the Wayback Archives (as mentioned above), which can then be used to appropriately adjust the profile page. Preferably avoid adding redundant categories or ones that require extremely subjective interpretation. It is usually better to stick to the already available options. Also, if you are uncertain about the requirements for characters to fit into a certain category, please contact any of the administrators and clarify. When uploading images or videos, do not check the "Ignore all warnings" option. If a file with the same name exists, a warning prompt will appear. Replacing pre-existing files is strongly discouraged without discussing it in a thread here. All characters in VS Battles wiki profiles should originate within actual stories, from notable or popular works. Do not add any original or fan-made characters to the wiki. If you wish to create any original/fan-made character profiles, feel free to do so in the FC/OC wiki. Do not create any joke profiles, as they do not fit into our tiering system. Also avoid creating profiles for fan characters, advertisement characters, YouTube personalities, music videos, memes, stage personas, and the like. If you wish to create such profiles, feel free to do so in the Joke Battles wiki instead. It is also prohibited to create profiles for fictionalised stage personas for other reasons, whether these have their origins in music videos, educational programs, or otherwise: For one thing, it is inappropriate for largely underage wiki members to discuss which real people that would hypothetically be most capable of killing each other, and for another, a vast majority of these artists are extremely willing to file lawsuits against anybody who uses their brand for which they own intellectual property rights, regardless whether or not these are meant to be used for commercial or fair use purposes. It would be recommended and preferable to avoid adding such profiles to Joke Battles as well. Preferably avoid adding character profiles that may be inappropriate or perceived to be in poor taste. This may include characters, weapons, etcetera, that are ill-suited for a statistics-indexing wiki, due to having no reliable feats, or ones from media which may be too controversial or otherwise unnecessary to be featured. This includes pages that would strictly be written as a joke, and as such more suitably belong in the Joke Battles wiki. If you wish to create character profiles from alternative canon, or composite, sources, first read through our regulations page to see whether or not it is allowed. Do not create profiles for deities and other figures from religions with a significant quantity of modern day followers. This includes those described in Christianity, Hinduism, Buddhism, and Islam. Featuring these types of profiles is certain to upset large groups of people. The exceptions to this are ones with an incredibly small amount of current followers, such as the Aesir faith, and ones for which the followers are agnostic, such as Shintoism. Do not add any versus match-up threads from external sites to profiles, as they are usually in conflict with our tiering system, and recurrently do not meet our standards. Also, feel free to remove any such existing links that you come across. It is preferable that the profile pages are named what the characters they represent are commonly referred as. The order of the name of Japanese characters is reversed, as their family name comes first, and then their first name, for example Monkey D. Luffy. Given that it would be confusing for visitors if we refer to him as Luffy D. Monkey, it is preferable to attempt use the most commonly known English order for each individual character's name, whether that is the Western or Eastern version. We have an extensive instruction page regarding how to properly use Crossovers for creating or scaling character profiles. Also generally try to avoid scaling between different fictions via author statements about one character being comparable with another. It will usually be very uninformed assumptions, or hyperbole, and even if both stories have the same author, the portrayal of the different characters' power in relation to each other may still contradict these statements. Preferably avoid writing cheeky, pointless, and/or opinionated captions for the images. Please do not plagiarize from other wikis or online databases. It is unprofessional and shows a lack of effort on the part of the user. If you are getting your information from another wiki, please rephrase and summarize the passage in your own words instead of simply copying it. While using profiles from other wikis as references for statistics is generally not prohibited, if the reasoning for the listed statistics can not be explained, or if the profiles are of sub-standard quality, they might be deleted. When creating or editing a profile, if you use an image from a fan artist to represent the character/weapon/vehicle/verse in question, provide a caption below the picture that gives credit to the artist, and if you can, provide a link to their website or profile on DeviantArt, Tumblr, etcetera. Remember to sign character profile talk page posts with your username. Use four tilde signs (~) to do so. Regarding direct information from the author/creator of a character: We do not use statements from them that are phrased in an uncertain, uncaring, and/or unspecific manner, such as "Could be", "Maybe", "Probably", "Possibly" etcetera. Brief or vague answers to fan-questions via social media are also generally disregarded, whereas more elaborate explanations in serious interviews are usually considered more reliable. When a statement from a character, guidebook, or even word of god contradicts what occurs in the series, they won't be used. For example, if an author says that a character from his work is incapable of shattering planets, even though it has destroyed galaxies on-screen, we will always go with the latter, rather than the former. The statement need to be consistent with what has been revealed within the fictional franchise itself. Otherwise, it will be considered invalid. Author statements will only be accepted when they clarify what has been shown or implied in the series itself, and will be rejected when they contradict what has been shown to the audience. Statements that technically do not contradict anything shown in the series will still be rejected if there is no evidence that they are accurate. Preferably avoid creating any supposedly "all-powerful" 4th wall-breaking real life author avatar characters, or author avatars in general. Before doing so, please read our Reality - Fiction Interaction guidelines, and try to evaluate if the character in question is significant within its story. Meaningless 4th wall breaking, and winks at the audience, do not equate tier 0 in any way, shape, or form, and can potentially open doors for new members to start looking at real life humans as an "omnipotent species" that can fight with ideas, words, and pictures. Exceptions have been made for Andrew Hussie, the Annoying Dog, and "The Writer" of DC Comics. The former was not played as an invincible character within Homestuck, whereas the second was not a true author avatar, just a joke character. Finally, the third has been established as an inseparable part of Grant Morrison's DC cosmology, and is ranked at Tier 0, not for being an author avatar, but for its established role in comparison to everything else within the franchise. Nevertheless, it is very unwise to allow too many explicit author avatars, as they severely blur the line between fiction and reality. When adding yourself as a supporter or opponent to a certain franchise, please avoid cluttering the relevant verse page with personal comments. They are distracting, and uninteresting, for casual visitors. Do not create verse pages for companies. We have made exceptions for Disney and Nintendo, due to their extremely iconic statures, and occasional interaction between their properties, as well as for Dreamworks, and similar prominent animated movie imprints, with characters that have no other verse page of their own, where they can be listed, but a "verse" is generally defined as a shared continuity. Do not link to the Superpower Wiki in the Powers & Abilities sections, as their method of classifying powers is very different from our own standards, rather only link to the powers listed within this wiki. Linking to the main wiki for a certain franchise at the top of verse pages is allowed, in order to provide further information, as is linking to accepted Narutoforums calculations within the character profiles. We tend to accept scaling statistics from attack and special move animations for computer games, as they are generally legitimate demonstrations of different characters' powers and abilities, that are recurrently confirmed within guidebooks and similar sources. However, they can severely contradict the otherwise displayed scale of a verse, and should therefore be evaluated on a case-by-case basis. Do not insert links to our message board discussions into profiles. Calculations should be placed in blog posts, evaluated, and then linked to, if they have been accepted. Do not add images or videos to different categories. The categories are mainly supposed to showcase the related character profile pages, and it is unwise to encourage members to clutter them with lots of comparatively irrelevant additions. "When creating new character profiles it is strongly preferred that you add explanations for the extents and natures of less self-evident and more confusing powers and abilities. Examples include Reality Warping, Conceptual Manipulation, Time Manipulation, Soul Manipulation, Mind Manipulation, and Causality Manipulation. Such powers are likely to be inaccurately interpreted, whether by casual visitors or in versus matches. 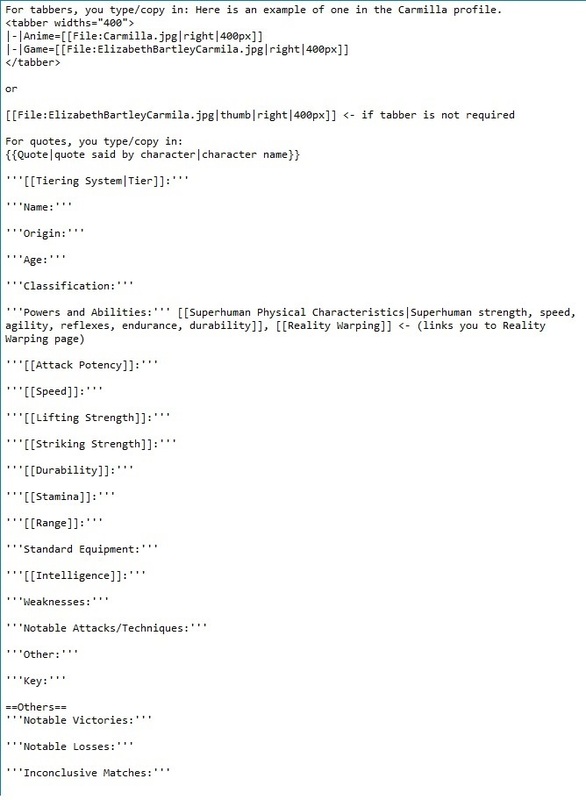 As such, it is appreciated if you specify the nature and scope of these abilities, preferably in "Notable Attacks/Techniques" sections, near the bottom of the character profiles. As stated in the Canon page: When different source materials give different versions of the same feat, and by that they contradict each other in the depiction of the feat, the primary canon takes precedence over the secondary canon. If the feat is correctly depicted over multiple canons, any of these can be used to judge the feat. Should different results be reached by judging the feat through multiple canons, the result of the primary canon will have priority. Please note that fiction uses words like "World", "Dimension", and "Realm" to describe a number of different things. As such, the context in which the terms have been used should be carefully analysed before starting content revision threads. Please do not directly link pages to free online manga-reading sites. These sites can be laden with malware and cause legal troubles for users living in countries where anti-piracy laws are strictly enforced. If you would like to link a manga scan or similar image as evidence for a feat, please download the picture and upload it as an image on this wiki or to a third-party site like Imgur so that it may be used fairly while minimizing potential ramifications. Please note that characters that are mechanical or undead should not automatically be assumed to possess infinite stamina, unless this trait has been clearly defined within the series or by the lore. Please do not create profiles and verse pages for games and other media that have not been released yet. There is usually insufficient information available for proper scaling and they may not even ever be finished. If you discover such pages, please report them in the profile deletion request thread linked to in the front page of the wiki. If there exist several calculations for a specific feat that have all been evaluated and accepted, but give conflicting results, the matter of which one that is most reliable should be first be discussed in the calc group forum by the calc group members before any changes are applied to the relevant character profiles. The calculation that is finally accepted should then be added to the related verse page calculation section, and the rejected versions removed. Given that Marvel and DC comic book franchises have been shared by hundreds of different writers, few of whom are interested in remotely coherent power levels, we have specific power-scaling regulations for their characters. For Kingdom Hearts, given that most of the Disney characters were strictly displayed at power levels close to those within their original movies when in their respective home "worlds" (With some notable exceptions), power-scaling them to Sora is not allowed, unless they manage to travel between worlds themselves. It should be noted that files that revolve around Pokémon Trainers, Digimon Tamers, Duelists from Yu-Gi-Oh!, Brawlers from Bakugan, etc have stats that revolve around the team of whatever monsters said character uses to fight for them. However, these files should still have human stats for their own feats. For how this would play in battle, see the Versus Thread Rule.